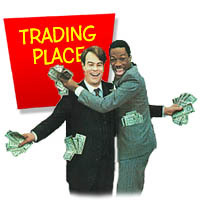 80's Retro Club From The Eighties: Trading Place: Buy and sell your 80's goods here for FREE! Trading Place: Buy and sell your 80's goods here for FREE! Whether you are looking to buy, trade, or sell something from the 80's, this is for you. We've created this free trading place to help you and your fellow 80's collector get together. You can browse through or search our ads, or submit your own! You can modify and delete your ads. And we added a new feature so that people can reply to your ad without your e-mail address being on the site (This is good so shady spammers can't scour the web and find your address). Be sure to read our disclaimer first! Don't forget that you can buy some 80's stuff from us as well: movies and music CDs. Items from the 80's that people are looking to own. Have something from the 80's you'd like to sell? Or have you been looking for some 80's stuff? Submit your ad here! You'll find that the Trading Place is pretty simple. Click on submit ad to submit an ad, click on the section you want to browse, or use the search engine. Easy, huh? There's more info that may help.